IQ-501 – Perfect quality at your fingertips. 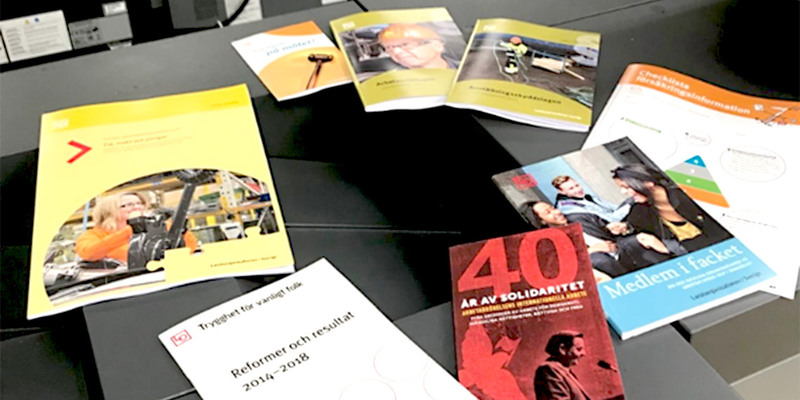 Central Reprographic Department Bantorget Grafiska, owned by Stockholm based Swedish Trade Union Confederation (LO), chose two Konica Minolta AccurioPress C6100s to help better manage production demands and turnaround times. LO is one of the largest and most well known unions in Sweden. Wage bargaining, international activities, trade union education, children's and young people's education, gender equality and social security are some of the areas LO is responsible for co-ordinating. There are 14 branches and approximately 1.5 million members. LO wanted to find a better way to manage constantly growing color print volumes by maximising and streamling production time. While LO liked the performance features of the 1,200 x 1,200 dpi AccurioPress C6100 that achieves superior productivity at 100 ppm, and identical high-speed printing for a wide range of paper weights, it was the IQ-501 that sealed the deal. In fact, once LO had seen what was possible, it could not do without it and did not consider any other systems on the market. IQ-501 makes best use of the speed and efficiency of CCD scanning and the accuracy of spectrophotometry. The result is automatic, in-line and highly accurate measurement of colors and registration. 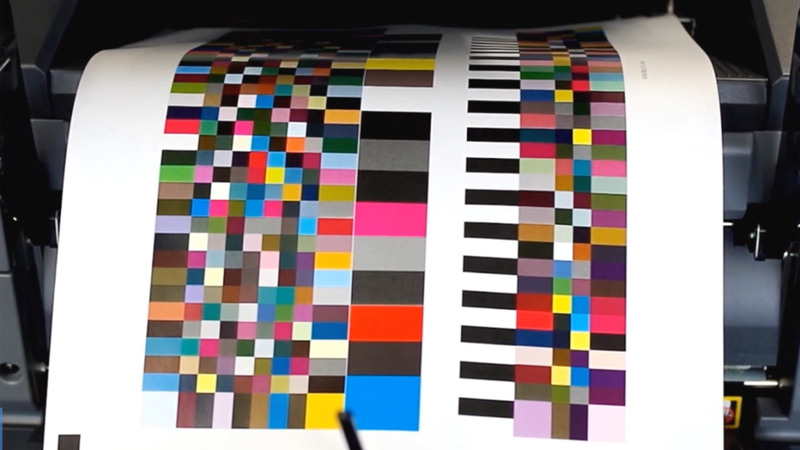 Color targets can be set within the controller software at the start of a run, and the IQ-501 system ensures through Intelligent Quality Care that color density and fidelity remain constant throughout the print run by checking each sheet in real time, with a closed-loop feedback system ensuring continual adjustment where necessary. Perfect front and back registration are also assured, with automatic adjustment of image position, skew and rotation, and there is no slowdown. Printer profiling is quick and simple too. LO began the investment process with a view to better managing print volumes. With the AccurioPress C6100’s initial set up time at almost zero and the ability to pre-store programs, job completion times are much faster. This means LO can print more jobs in a shorter time, it doesn’t have to run overtime and it can even take on external work to generate additional revenue. It is also enjoying enhanced reliability and print quality as well as huge time savings and print consistency. This is thanks to automatic front to back registration, color calibration and the automatic profiling of paper. Another benefit is the great relationship that LO has established with Konica Minolta. It enabled the operation to identify and implement the right solution supported by a highly knowledgeable and responsive service team. The need to address a number of production issues prompted Portuguese commercial printer Ligrate-Atelier Gráfico’s investment in a Konica Minolta AccurioPress C6085 with IQ-501 Intelligent Quality Care. Ligrate-Atelier Gráfico, from Amadora, near Lisbon, has been established for more than 30 years and has built up a team of qualified and skilled professionals to produce high quality work. It is committed to helping customers through all stages of design, creation and printing. As such it works closely with schools of architecture and design on diverse offset and digital print jobs from stationery to the most sophisticated colour work. Colour variations were being experienced during long runs as well. This meant Ligrate-Atelier Gráfico had to print more than was needed and then choose the best print to deliver. Production efficiency and costs were also being impacted by problems with registration and with some stages of the finishing process - business cards in particular were generating 20 % of waste. The Konica Minolta AccurioPress C6085 with IQ-501 Intelligent Quality Care was chosen after an assessment of all the applications Ligrate-Atelier Gráfico was producing in digital. Konica Minolta considered the applications being produced in offset that could be migrated to digital, pre-production processes and the difficulties the operation had with the current equipment. The paper grades used were even reviewed. The final convincer was a tailored press demonstration that proved to be a highly effective showcase. This showed Ligrate-Atelier Gráfico that Konica Minolta understood its particular business needs and could deliver a complete solution that answered them. IQ-501 makes best use of the speed and efficiency of CCD scanning and the accuracy of spectrophotometry. 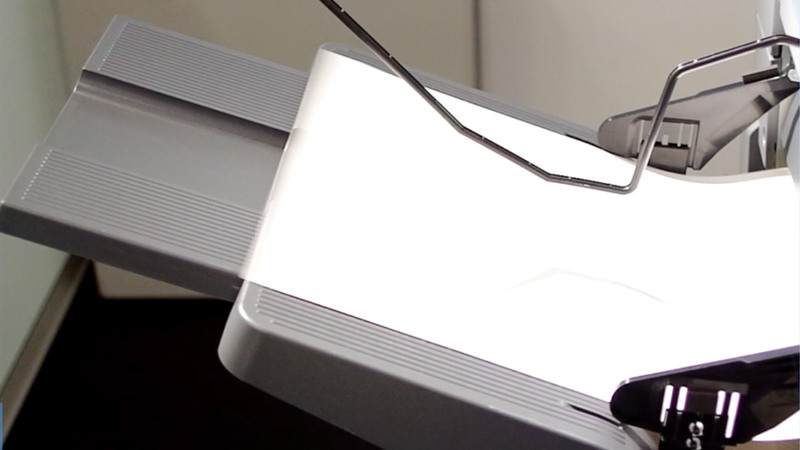 The result is automatic, in-line and highly accurate measurement of colours and registration. Colour targets can be set within the controller software at the start of a run, and IQ-501 Intelligent Quality Care ensures that colour density and fidelity remain constant throughout the print run by checking each sheet in real time, with a closed-loop feedback system ensuring continual adjustment where necessary. Perfect front and back registration are also assured, with automatic adjustment of image position, skew and rotation, and there is no slowdown. Printer profiling is quick and simple, too. As a result of the improved calibration Ligrate-Atelier Gráfico expects to make a significant saving in five years. Further savings are anticipated thanks to a 40 % time saving. The operation is also enjoying the fact that jobs are no longer being returned and there are no more issues with the registration. This partly due to the fact the press is calibrated every day and will run repeat orders without any problems. This means jobs can be produced offset or digitally without any colour variation. Ligrate-Atelier Gráfico especially liked IQ-501’s ability to perform automatic adjustments through Intelligent Quality Care as well. It can improve print quality, accuracy and consistency, minimise uneven density with density variation adjustment, through Intelligent Quality Care achieve best solids and high quality colour reproduction thanks to colour density control as well as smoothest gradations through exact colour reproduction. Headquartered in Vilnius, Lithuania, Greita spauda (GSP) is a fully managed print solutions company that provides customers with everything they need for their advertising and marketing projects – from concept to design, print and finish – all under one roof. Founded in 2007, the company employs 70 staff, with its print room employees working across two shifts. 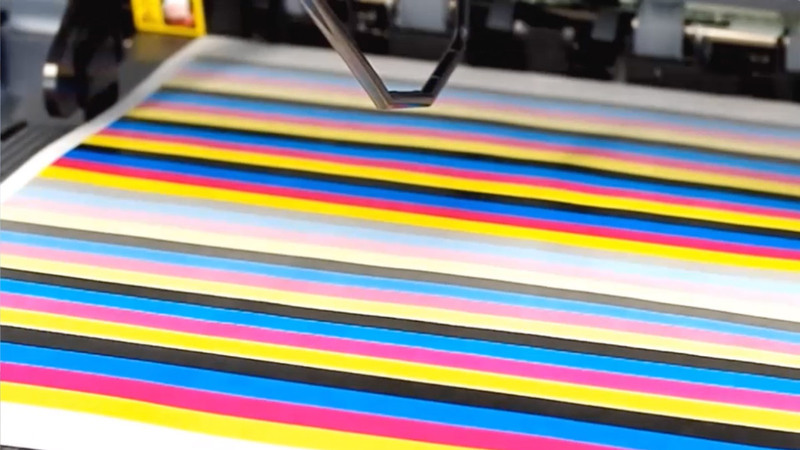 Ever ambitious to innovate and evolve its business, the company decided to focus entirely on digital printing and advanced finishing techniques, outsourcing its offset printing to partners. By implementing an AccurioPress C6100, featuring the IQ-501 Intelligent Quality Care, GSP made this transition seamlessly, maintained the high standards of quality and service that its customers rely upon, saved time and money and gained competitive advantage. Greita spauda (GSP) has built a successful managed print solutions business providing both digital and offset printing. Its monthly print volume exceeds 1.5 million sheets, with over a quarter of that volume – more than 400,000 – coming from digital printing. The company recognised that, by refocusing its business purely on digital printing, it could drive revenue opportunities through an expanded service offering and greater efficiencies – and provide customers with ever-more innovative solutions. It sought to identify a high-productivity, versatile digital printing solution that could deliver high quality and consistent output. Konica Minolta has been a trusted and reliable long-term partner for GSP, having been the supplier for starting the company’s digital printing business with a C6500 series machine in 2007. Beyond the highly positive experience with this solution, the commercial printer also appreciated the high level of customer care and service as well as the personal contact and exchange with the Konica Minolta Sales Manager. Over the following years, this has led to a continuous expansion of the partnership, with GSP acquiring further products until the point where its digital cut sheet printing services were entirely based on Konica Minolta equipment. Following a thorough evaluation of the available products on the market to support its new digital print strategy, GSP implemented an AccurioPress C6100 with banner and envelope print capabilities, featuring Konica Minolta’s IQ-501 Intelligent Quality Care Care to provide inline real-time registration and color calibration. While the strong relationship between GSP and Konica Minolta and the success of the previous projects were good arguments for taking this further step with Konica Minolta, the technology itself was highly convincing: only the Konica Minolta solution could deliver the performance, professional image quality and non-stop productivity that GSP demanded. With features including a maximum color print speed of 100 pages per minute, a wide range of print applications for paper and envelopes and sophisticated finishing versatility, the AccurioPress C6100 enabled the company to achieve outstanding digital image quality fast. The leading-edge technology of the IQ-501 Intelligent Quality leveraged the advanced workflow architecture of the AccurioPress with fully automated, closed-loop quality management tools for superior color consistency and front-to-back registration. Combined, they deliver a comprehensive, automated process management system that delivers precise color and superior image quality. The solution has already delivered outstanding efficiencies, both through reduced waste and spoilage quantity and the fact that it does not rely on special operating skills. This has empowered the company’s print room staff to focus on highervalue tasks, saving both time and money and ensuring a faster service for customers. Following the implementation of the new digital print solution, GSP was able to maintain its existing workflow, based on a job management system developed eight years previously. Furthermore, thanks to Konica Minolta’s innovative integrated image quality system, GSP was able to switch a proportion of the offset printing projects to digital printing. These projects were finished quicker, saving costs while maintaining high quality standards – a real driver for business success in a competitive market. With Konica Minolta as a partner, GSP’s strong market position has been boldly expanded as none of its competitors offer a solution to match the AccurioPress C6100 with IQ-501 Intelligent Quality Care. The company may be able to press this advantage as the solution – with its ability to complete a wider range of high-volume jobs more efficiently – gives it the potential to further expand its products and service capabilities, for example, through print, book and pack services on demand. want to offer your customers more value and creativity.